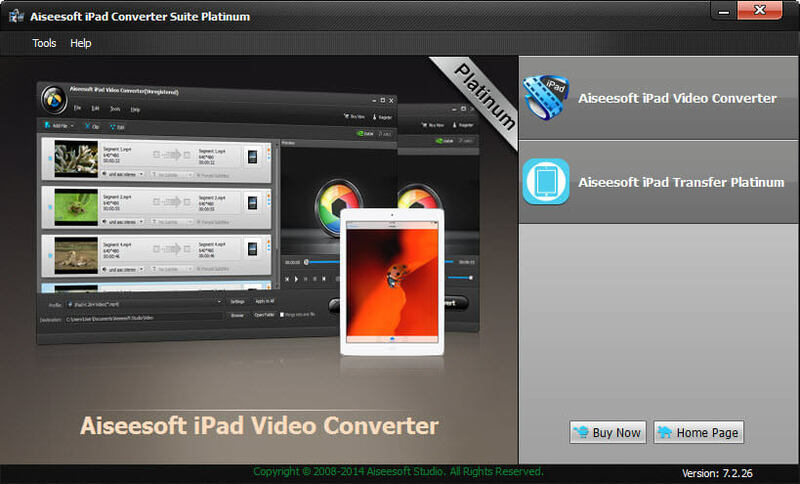 Aiseesoft iPad Converter Suite Platinum is packed with DVD to iPad Converter, iPad Video Converter and iPad Transfer Platinum. With it, you can rip any DVD disc and convert popular video/audio files to iPad, export music, movies, pictures, eBooks, iTunes U, TV shows, podcast, camera roll, voice memos and camera shot from iPad to computer, and import local video, audio, ePub, PDF, and image files to iPad with zero loss. Now it supports iPhone 5, iPad mini, iPad 4, iPod touch 5, iPod nano 7, Microsoft Surface and Samsung Galaxy Note, etc. Key Features 1.All Apple portable devices supported This transferring software works well with nearly all Apple devices, including iPad, iPhone and iPod. 2.Convert DVD files to iPad supported formats Aiseesoft iPad Converter Suite Platinum can rip and convert any DVD to iPad video/audio formats. 3.Convert any popular video to iPad This iPad Converter could convert all popular video formats, such as MPG, MPEG, MPEG 2, VOB, HD TS, HD MTS, HD M2TS, HD MPG, etc., to the formats supported by iPad. 4.Transfer files between iPad and PC It allows to transfer music, movie, pictures, TV shows, podcast, iTunes U, eBooks, camera roll, voice memos, camera shot, etc. from iPad to computer at remarkable speed. 5.Edit effect Aiseesoft iPad Converter Suite makes it easy for you to adjust video brightness, contrast and saturation for the customized playing effect. What is more, the function of Deinterlacing allows you to convert the interlaced video to a progressive one. 6.Adjust settings For great work efficiency, it is possible for you to set Video Encoder, Resolution, Frame Rate, Video Bitrate, Audio Encoder, Sample Rate, Channels and Audio Bitrate. 7.Preview The built-in player of this iPad Converter Suite provides you an access to preview the original video and the output video effect. 4Easysoft Mac MTS Converter is a professional and versatile MTS file Converter for Mac OS X users. So you can convert MTS file to various formats and extract or save the audio tracks on Mac OS X (including OS X 10.5 Leopard) with it. SpeedEase Video DVD Copy is a versatile DVD copy application that can copy DVD to any major video/audio format or most popular device. The built-in player empowers you to preview the DVD. Moyea MTS/M2TS Converter is an excellent conversion tool for converting MTS/M2TS file to almost all popular video formats. With it, you can get MP4, MKV, MOD, FLV, WAV, file to meet your needs of watching videos on your portable devices. Pavtube Youtube Converter for Mac is an all-in-one YouTube downloader and converter which can download and convert YouTube videos to AVI, MP4, WMV, 3GP, MOV. With it, you can enjoy the YouTube videos on your favorite mobile players. Cucusoft Zune Video Converter Suite is an all-in-one Zune Video Conversion solution. Includes 2 software: Cucusoft Zune Video Converter and Cucusoft DVD to Zune Converter. Convert any DVD / Movie + Convert Video files to Microsoft Zune Video. Odin Bluray to HD Converter can convert blu-ray videos (M2TS format) to High-Definition formats (H.264/MPEG-4 AVC, Apple TV h.264 720P, HD WMV, MPEG-2/MPEG-4 TS HD Video) with excellent and unmatchable ripping-converting speed. The DVD AVI Burner package perfectly converts any DVD to AVI, DVD to DIVX, DVD to XVID. You can rip DVD movies with DVD Ripper and play the output AVI videos on your PC, Pocket PC, Smartphone and other portable devices at anytime anywhere. Flash Video Encoder, a powerful video to FLV converter, converts any video to FLV and Flash SWF, like MP4 3GP MPEG WMV AVI to FLV and H.264 HD FLV. The easy video to FLV encoder also converts video to Flash, HTML, images, and creates Flash players. This site does not contain serial number, crack, keygen Aiseesoft iPad Converter Suite Platinum serial number : serial number is the simplest type of crack. A serial number(cdkey,product key,etc) is register the program as you may already know. a crack or keygen may contain harmful software. If you cannot find the exact version you want, just give it a try. for more information read .nfo/.txt/.diz file include in zipped file.